Since this is my first Fonderie build, I thought it may be of interest to do as a 'progress in pictures' feature. 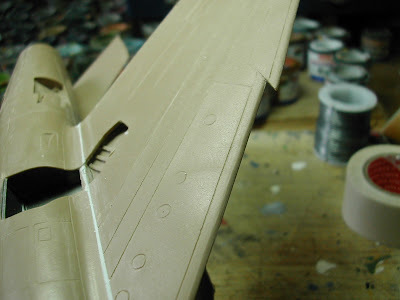 Before the undercoat went on, I noticed the odd undulations in the wings, mostly between the panel lines. This is not the easiest plastic I have ever worked with. As I gently rubbed down these surfaces, I noticed that in a couple of spots it began to blister; discoloured patches of surface started to lift. Not wanting to remove these and use filler, I very carefully peeled them back and added a spot of glue. These could later be rubbed down. 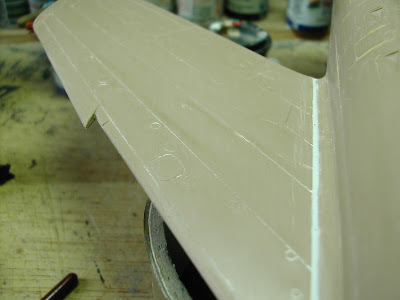 You can see here too the filler needed for the wing roots, top and bottom. A two tone bare metal finish was favourite for this model, and would add nicely to its colourful red stripes and national insignia. The model was almost entirely masked up after the undercoat had dried. 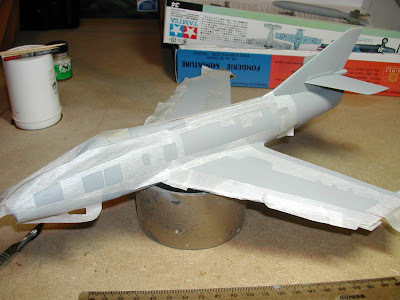 The masking was cut out with a very sharp No 3 blade, using the panel lines as a guide. 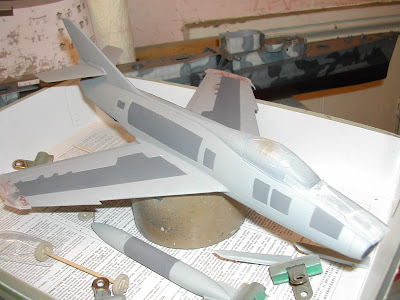 Matt dark grey paint was then applied and the masking tape removed promptly, avoiding paint build up on its edges. The model was then treated to a deep gloss finish - two coats minimum. 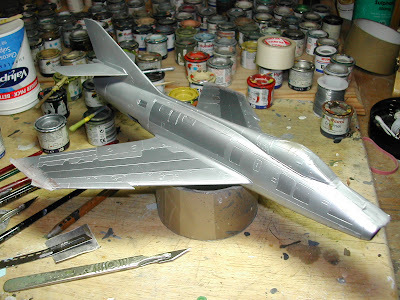 As you can see, this gives the Alclad II a good base and an excellent finish is achieved. I am currently fitting the decals and 101 other jobs. So, as usual, more later.